The plan originally was to just order some fried rice. Because it was on my mind and I didn't really feel like cooking. Okay, maybe order some white rice too (because you mix them together and have more rice... duh). And maybe soup. But that's it. This was on Monday. 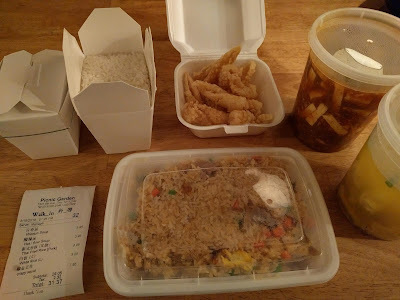 And I forgot that my go-to Chinese take out place is closed on Mondays. Sure, I could have just went home and rummaged though the fridge for something. But no... stubborn me needed fried rice. So I hit up Picnic Garden. It was okay the last time I was there. And I wanted the most basic of food items - fried rice. Fried freakin rice. But then I looked at the menu. And my eyes glazed over. And the next thing I knew, the lady walked out of the kitchen and handed me my order. A $31 dinner for just me. Fried rice was pretty good, with even bigger cuts of pork than usually found in pork fried rice. The squid was tough and tasted more like the oil it was fried in, and just a bit of pepper. Wonton soup broth was good, the wontons tasted pasty. The hot & sour soup was no good. I could barely get though half of it. Lesson learned - should have gone to Lucky Corner. Not saying I'm going to swear off Picnic Garden, I decide on that after I try the hot pot.